I am going to fly home (=Vancouver,BC) on a Saturday via LAX. I'd like to purchase a few things online and send them to a location near / at LAX, pick it up and check them in. This would save on shipping and customs -- the item is 61 linear inches and 30 lbs so shipping it is very expensive but just checking it in is cheap as I do not have another checked in luggage. My plane is scheduled to land on 2:25PM and though I have a Nexus card and carry on only, still, a location closing at 4PM on Saturdays is very risky I think. Best would be around the clock to accommodate for any shenanigans. Edit: I am coming from Paris and my next flight is 7PM the same day. Did you bother searching online for locations with FedEx, UPS, DHL etc? 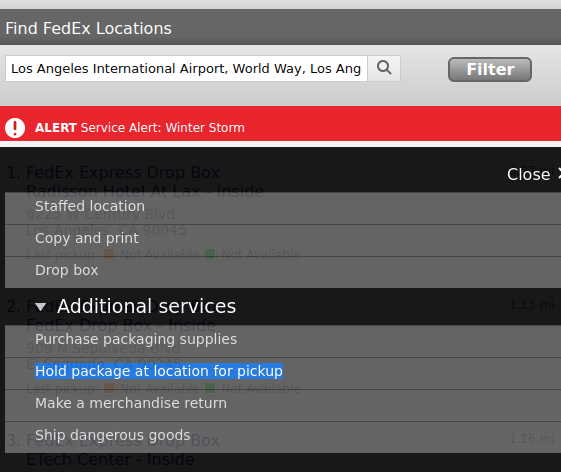 On Fedex.com, click Locations on top, enter Los Angeles International Airport to search for, and then click Filter, under Additional Services you can find "Hold package at location for pickup" to find an office just outside the airport open until 9pm on Saturday that offers hold for pickup services. There's reliable public transit there as well: a shuttle to the green metro and then the green line. Not the answer you're looking for? Browse other questions tagged shopping lax or ask your own question.